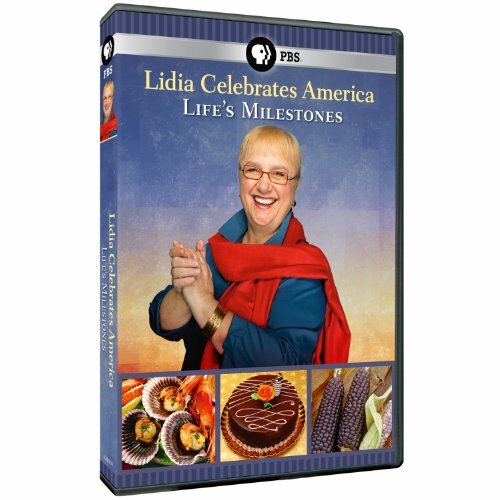 Arlington, Va. - December 27, 2013 - PBS Distribution today announced it is releasing Lidia Celebrates America: Life's Milestones on DVD. Renowned chef and culinary author Lidia Bastianich continues her engaging cross-country journey of the United States to experience the exuberance of American culture through food in Lidia Celebrates America: Life's Milestones . In this program, Lidia joins four families as they celebrate special rites of passages including a French-Cajun sweet-sixteen birthday party and country music debut in Nashville, a Greek Orthodox baptism for triplets, a Brazilian-American culinary student's college graduation, and a Navajo house blessing ceremony. Life's Milestones will be available on DVD beginning January 21, 2014. The run time of the program is 60 minutes and the DVD SRP is $24.99. DVD special features include nine printable recipes as well as additional interviews with Gabrielle Hamilton and Nicole Petallides. In her travels, Lidia is joined by notable guests, including award-winning songwriter/producer Victoria Shaw, who walks Lidia through the heart of Nashville's Music Row, chef/restaurateur Gabrielle Hamilton, owner of the acclaimed Prune in New York's East Village and best-selling author of Blood, Bones & Butter, FOX Business Network Reporter Nicole Petallides, who takes Lidia to Astoria, Queens for a traditional Greek meal at Taverna Kyclades, and chef Freddie Bitsoie and Grammy winning singer Radmilla Cody, both of whom are Navajo, who show Lidia the majestic grandeur of the Navajo Nation's Four Corners region. This fourth edition of Lidia Celebrates America showcases the diverse customs, foods and traditions celebrated by families and communities, which invite Lidia and viewers to participate in these "festive landmarks of life," as Lidia calls the notches we cut in our belt to mark our growth. These communities take great pride in their culture, and have welcomed Lidia with open arms, as one of their own. To Lidia, America is not only a melting pot; it's a big, fat dinner table of a land where everyone is allowed to bring his or her own special dish and then partakes with grace and interest, and even love, the plates of the others - which is what this series hopes to convey. Lidia's first milestone celebration takes her to Nashville for a French-Cajun Sweet 16 birthday party with up and coming country star Lacy Cavalier. Lacy is also preparing for her big debut at the famous Bluebird Cafe, where Garth Brooks and the Indigo Girls and a host of others first began. Lacy grew up in Louisiana Cajun country, but moved to Nashville to be mentored by Emmy award-winning songwriter and producer Victoria Shaw. Victoria has sold more than 65 million CDs and is responsible for discovering Grammy-winning group Lady Antebellum. She gives Lidia a tour of Nashville's Music Row, the heart of the famed neighborhood that houses record labels, studios and producers - where she's more likely to "borrow a cup of lyrics, than a cup of sugar," she tells Lidia. Joining Lacy for her Sweet 16 is her family, including her dad Kevin, who prepares a favorite Cajun dish: Alligator Sauce Piquant. He explains to Lidia all the diverse combo of cultures in the dish's ingredients, including French, Spanish, Creole, and Native-American. Victoria and Lacy warm up with a duet in the living room, and Lacy takes the stage later for her first live performance introducing her to the Nashville music scene. The second story in Life's Milestones comes in threes as the Atsas family's new additions, triplets (Isabella, Julia, and Olivia) are baptized in a traditional Greek Orthodox service. Following the ceremony, Lidia learns about and experiences the traditional Greek foods and music that make the occasion so festive. She is introduced to all of the classic dishes - Gyros, Spinach Pie, Cheese Pie, Stuffed Grape Leaves, and more - as they are prepared for a Greek Food and Culture Festival, and to the homemade drink, Tsiboro, the Greeks' version of moonshine. But her Greek educational experience doesn't stop there. To bring added perspective, Lidia goes to New York to meet FOX Business Network reporter Nicole Petallides, also of Greek descent. Nicole and Lidia visit the Greek section of Astoria, Queens, near where both of them actually grew up. They share family secrets and recipes as they cook two classic Greek dishes at the Taverna Kyclades: Octopus Salad and Spanakopita. The third rite of passage focuses on college graduation seen through the eyes of Brazilian-American culinary graduate student, Alex Galimberti, who is about to receive a Masters of Liberal Arts in Gastronomy from Boston University. He is ready to dive right into the culinary world and is inspired by the mentors such as Lidia, Julia Child and Jacques Pepin before him, as he prepares to begin his own career combining food and tourism. To offer a personal perspective on what Alex is about to encounter, Lidia meets with New York Times' best-selling author and restaurateur Gabrielle Hamilton, who is chef/owner of Prune in New York's East Village. Noted chef, author and TV personality Anthony Bourdain described Hamilton's Blood, Bones, & Butter as "simply the best memoir by a chef ever." Lidia also meets up with Alex at one of Boston's fresh seafood vendors to choose the freshest razor clams and other ingredients for a Peruvian Seafood Ceviche to welcome his father and mother, who were raised in Peru and Germany, respectively, and his siblings, who are all now scattered everywhere. In the final story of Life's Milestones , Lidia travels to a remote area of Utah to witness an ancient tradition: a Navajo House Blessing. An invitation rarely if ever filmed or extended to outsiders, it is especially meaningful to Lidia and she feels privileged to take part in this centuries old sacred custom. To celebrate this rite of passage, families host a four-day celebration that includes native foods, Navajo traditional dance, music and even a medicine man. According to Lidia, the ceremony is as unique as it is moving: the singing, the ceremony, the blessing, and the meal. In fact, students in a graduate architecture program designed several of the homes; unique structures, created off the grid. Joining Lidia are Navajo chef Freddie Bitsoie, a member of the Dine (Navajo) Tribe, and Grammy Award-winning singer Radmilla Cody, a former model and Miss Navajo Nation winner. Together, they observe the traditional Blessing Ceremony where a Navajo family receives peace, harmony, and good luck for their new home. As tradition states, the ceremony also prevents general misfortune, hardship, bad dreams, and evil spirits from entering the home. A meal of fresh lamb with oil and scallions and fried bread and stew is prepared using traditional methods. Lidia learns the meaning of multi-colored varieties of corn meal and that all Navajo doors face east, in order to greet the sun. Lidia Celebrates America is a lively exploration of the rich diversity of cultures across the United States, and the vibrant ethnic and religious customs and traditions observed by various groups - in which food is a common denominator that connects all human beings. Previous series focused on the different ways Americans celebrate weddings, holiday traditions and independence. For more program information, visit pbs.org/lidiacelebratesamerica. To view recipes featured in the series, go to PBS Food: pbs.org/food. Lidia Celebrates America DVDs currently available from PBS Distribution in stores and online are "Holiday Tables & Traditions;" "Weddings: Something Borrowed, Something New;" and "Freedom & Independence." Lidia Celebrates America: Life's Milestones is a production of WGBH Boston and Tavola Productions. Lidia Bastianich is host. Executive Producers are Lidia Bastianich and Laurie Donnelly. Funding for Lidia Celebrates America: Life's Milestones is provided by the Corporation for Public Broadcasting. Tavola Productions, an entertainment company that produces broadcast productions of quality including Lidia's Family Table, Lidia's Italy and Lidia's Italy in America, was founded by Lidia Bastianich. WGBH is PBS's single largest producer of content for television (prime-time and children's programming) and the web, including some of your favorite series and websites: NOVA, Masterpiece, FRONTLINE, Antiques Roadshow, American Experience, The Victory Garden, This Old House, Simply Ming and Gourmet's Diary of a Foodie, to name a few.